I have a question. There’s this cute guy at Dunkin Donuts that I want to talk to. So far I haven’t used any magic at all. I work at wendys. The stores are literally right across from each other so during my break I go there and get a little drink. Ever since I’ve seen him he’s been the cutest thing I’ve ever seen. Every time he sees me he says hi and I think he said “sup shorty” to me. I’m not 100% sure because I had headphones in, but it sounded like he said it. He also got off work and he seen me walking my dogs while he was in his car and he waved hello to me. I waved back and smiled. He’s super cute. I haven’t used any magic yet but I do want to use this love oil my mom has (she didn’t get the love oil from lucky mojo). I don’t even know his name yet. But should I rub the love oil on me while visualizing him before I go to Dunkin’ Donuts? How should I use the oil? I don’t want to use any candles. I do want to be in a relationship with him. Since this is a forum about using Lucky Mojo products, we cannot make any recommendations about using products made by other sources. Quality is key when it comes to using magic to get results. I have Love Me Oil and can see the herbs and roots in the bottle. Knowing that the quality is there helps me focus my work without worrying if the oil was made properly. I would recommend starting with Look Me Over and Bewitching products. 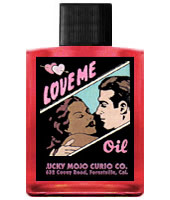 Then if the relationship starts getting serious, get some Love Me oil from Lucky Mojo.